This travel article appeared in WorldCrunch.com. 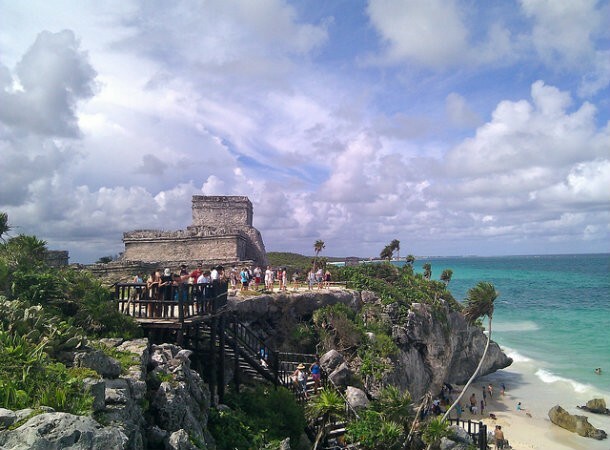 All one can say is–poor Tulum. Sumptuous beaches and low-key vibes in Tulum, on Mexico’s Caribbean coast, have attracted those keen to avoid the crowds and bling of the most popular resorts. But will it last? This “Mayan Riviera” town is known for both dreamy beaches and crystalline waters, as well as rare Mayan ruins. We can say that Tulum is everything nearby Cancún is not. Instead of noisy hotels, it features environmentally friendly bungalow-style tourist lodgings. Prices remain affordable. And the main consumers here continue to be of the “hippy” or backpacking variety. Changes, however, are afoot. Thanks to surge in attention from real estate investors, Tulum may well go the way of Cancún and Playa del Carmen, former fishing towns that are now top international tourism destinations. Interest in the village is growing steadily. Tulum’s population has grown threefold since 2000, and since 2008, employment opportunities have doubled. The state government of Quintana Roo, furthermore, is expanding a rail network to connect strategic points and boost hotel, catering and tourist activity. All this, according to sector sources, is being done in such a way as to protect the area’s fascinating natural landscape, which has attracted various celebrity visitors, including Demi Moore, Heidi Klum and Jude Law. Small beachfront hotels, in the meantime, are remodeling their facilities and raising prices every season. There is an increase both in the number luxury boutique hotels and in the quality of available lodgings. More gourmet eateries have opened, while the overall number of visitors, many of them “eco-chic” tourists from New York, has risen as well. All this has fueled a desire to exploit the area’s real estate potential. An example is the Aldea Zama project, which includes plans for a golf course, living spaces and a “downtown” promenade complete with restaurants and boutiques, in the manner of Playa del Carmen’s Quinta Avenida (Fifth Avenue). Investors seeking higher returns have already begun looking further out, with some people purchasing cheaper plots outside Aldea Zamá or similar settings. Other options include larger plots by the sea, which are ideal for hotels or beachfront condos and are valued in the millions, or 300-square-meter lots, located approximately 10 minutes from the beach, which cost somewhere in the $40,000 range and where buyers, for an additional $120,000, can build a two-story residence and swimming pool. Riviera Maya Property Consultants, one of the agencies operating in the area, says investors can expect a steady return. It claims that property prices are rising by an average of 8% annually — in some coastal areas the rate is higher still — and that people who are buying to rent can expect an annual income of approximately 10%. The recently discovered paradise of Tulum is already attracting investors from Mexico itself, the U.S. and Argentina, among other places. Riviera Maya analysts say the growing interest is due in part to ongoing economic problems in southern Europe and to the absence of similarly attractive real estate opportunities in the U.S. It hardly comes as a surprise, they say, that investors are tapping into the emerging Mexican economy, especially given Tulum’s spectacular setting, perfect climate, and proximity to the U.S.